mundane jane: Watch the skies. We Southerners are known for our slow and easy ways. We talk slowly. Otherwise, we would never be able to understand one another. We don't like to get into too big a hurry when there's a big decision on the table. And during the warm weather months, which stretch from April well into October, it's important to try to navigate as slowly as possible. If you've ever tried to cross the street when the temperature is 98 degrees at the same time that the air around your head is 90 percent water, then you understand why. Breathing takes priority over hurrying in the South. Unless there's a big storm cloud brewing. When the National Weather Service issues a tornado advisory, we all know to get the lead out. You just can't be dragging your feet once the tornado siren starts to blare--unless it's your lifelong ambition to fly through the air alongside your hot water heater and the neighbor's satellite dish. Everybody knows this--even the littlest of little bitty children. Certainly, by the time I was old enough for school, I'd been dragged out of bed in the middle of the night to beat it to the root cellar plenty often. It bears remembering that this was decades before anyone had even thought to install a weather siren and our early warning system consisted solely of the men standing on the porch, smoking and watching the skies. And if, once or twice a season, one of them called through the screen door to "Get the kids," even the smallest of us knew to check our hearts to be sure we were right with God before taking that first step into the yard--even if our destination was a trap door around the end of the house. 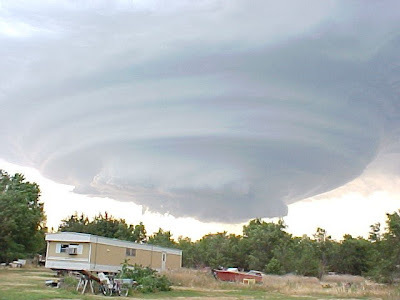 The sight of an approaching funnel cloud has been known to make believers of many a forsaken reprobate. All of which sets the scene for Sunday afternoon, when I was sitting and working my way through almost a week's worth of TiVo, and--as we say in the South--it came a cloud. The sky turned dark as night, and the rain was coming down in sheets. My sole concession to the storm was to reach over and turn on a lamp. As long as the satellite was still up and receiving a signal, I wasn't too concerned. Until lightening hit a transformer just down the block. It sounded like it was smack in the middle of my living room. The hairs in my nose stood up. You might hear people tell about how they may be old, but that they can still move when the situation calls for it. I am not one of those people. I injured myself in all kinds of ways, just trying to get up off the couch and away from the windows. And I stepped on the cat. Love it. Especially "it came a cloud." So pitch-perfect.